According to a running series from Radley Balko at the Huffington Post, this is only one of countless raids-gone-wrong over the past few decades—raids that demonstrate the growing militaristic police force and the dangers we all face when confronted by them. The SWAT team were tipped off that Hirko might be selling drugs out of the home he shared with his girlfriend. Rather than substantiating this tip, they set up a raid. 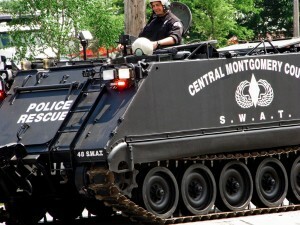 The SWAT team threw a flash-bang grenade through the window, just seconds after knocking. Then, they stormed the house. Hirko, thinking he was being robbed, was found holding a gun in his home. The police opened fire. Officer Joseph Riedy shot him 11 times, nine of which were in the back. The Bethlehem SWAT team was a rag-tag bunch. They had no written procedures or guidelines and no standards for joining. If you were a cop and you wanted in, you were accepted. They were headed up by Officer Kirby Williams, someone who senior officials in the department had been warned about—“If the wrong guy gets up there, somebody was going to get injured or killed,” warned one officer. Eventually, in 2004, Hirko’s family was awarded an $8 million judgment in federal court—almost one-fourth of the Bethlehem’s city budget. In the society we now live in, where cops can seemingly do what they want in an effort to further the “War on Drugs”, common sense goes out the window. The city’s expert witness in the case, a SWAT member himself, testified that SWAT officers should not wear identifying uniforms and that the police were right to storm Hirko’s home rather than confronting him at the door or outside (the old—“come out with your hands up” routine). In other words, the “expert” said the raid on Hirko went off as planned. In Pennsylvania, as well as across the country, law enforcement will go to extremes to “get their guy”. If you’ve been “got” and now face drug charges, we may be able to help. Contact our offices today.